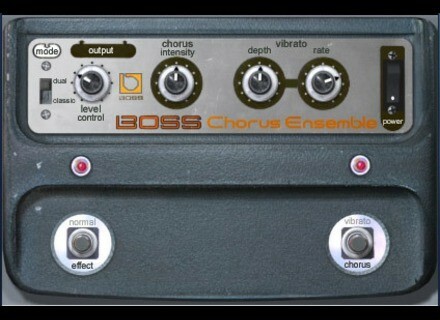 Boss CE-1, Software Chorus from Universal Audio in the UAD Plug-In series. loudfunk's review"Sounds just like my real one..."
As with all their stuff, it's solid. 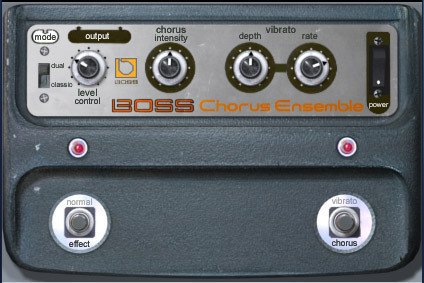 The Boss CE-1 Chorus Ensemble is another classic effect faithfully reproduced by our ace modeling engineers. The CE-1 is considered by many to the defin- itive chorus effect, renowned for its rich and unique timbres. Even for the mix engineer, stomp boxes can provide “secret weapon effects” not found any other way. In 1976, BOSS originated the chorus effect pedal, and nobody has come close to matching the CE-1’s captivating chorus sound since then. Its unmistakable warm analog stereo chorus and vibrato have been heard on countless tracks; particularly on guitars, bass and electric keys. Universal Audio has been commissioned by Roland to accurately model the CE-1, and the results are nothing short of spectacular. The Boss CE-1 has two operating modes, chorus and vibrato. Only one mode can be active at a time. The operating mode is set using the Vibrato/Chorus switch. This is an effect bypass switch. Click to enable/disable the cho- rus or vibrato effect. The effect that will be heard is determined by the Vibrato/Chorus switch. The active state is black text. The inactive state has gray text. The default state is effect. This is not a plug-in bypass switch. The hardware CE-1 has a slight affect on the sound even when the effect is “bypassed” in normal mode. We have mod- eled the plug-in faithfully and like the hardware unit, when the effect is by- passed with this switch, audio is still processed to sound like the CE-1 in “nor- mal” mode. To disable audio processing, use the CE-1 Power Switch. The Stereo Mode switch determines the operating mode of CE-1 when the plug-in is used in a configuration with stereo input, such as a stereo audio track insert or stereo effects bus. The hardware CE-1 has only a monophonic input. Its output can be mono (wet and dry signal mixed at one output jack) or stereo (dry signal in one output jack, wet signal in other output jack). We’ve adapted the model for the modern era, enabling a true stereo input.